We missed out on our every-two-years show with Steve Gillete and Cindy Mangsen in 2018 because of scheduling complications, but we’re happy to welcome them back in 2019! The show will be in Beckman Institute Auditorium (our usual, smaller venue.) We look forward to the great songs they bring us, a mix of originals, gold nuggets from some of their contemporaries, and a few familiar standards. Steve made a big splash very early in his career when he wrote the song Darcy Farrow which was recorded by Ian and Sylvia at the height of their time together. The song—so timeless that it is thought by many to be an old traditional song—was later recorded by such performers as John Denver and Nanci Griffith. Steve has gone on to write many songs that have been recorded by other folks, such as Kenny Rogers, Waylon Jennings, Tammy Wynette, Linda Ronstadt, Towns Van Zandt, and Jerry Jeff Walker. He’s a songwriter’s songwriter, and he still excels at it. 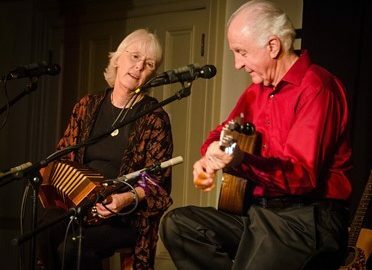 Cindy Mangsen plays guitar and concertina. She is also known for her beautiful voice. Early in her career, she gained a reputation for her fine interpretations of haunting songs from Francis Child’s collection of Scottish and English ballads, with their American variants. Cindy is a fine songwriter herself, ranging from the beautiful Songlines to an entire album of cat songs! We can only hope that she will sing Rudy’s Great Adventure, the true tale of a cat who got his head stuck in a garbage disposal. We still hope that “The Trio,” which includes Priscilla Herdman, Anne Hills and Cindy, will will one day come to California to do a show. Steve and Cindy’s harmonies, humor, and their rapport with an audience makes their a total delight. Over the years, they have a compiled a tremendous body of fine songs, which they continue to add to. Tickets are $20 for adults and $5 for Caltech students and children. They can be purchased on the phone (626-395-4652) with a credit card (a service charge will be added per order), purchased at the Caltech Public Events Ticket Office in the Spalding Building (California Blvd. and Wilson Avenue) for face value (open Monday-Friday from 10:00 a.m. to 4:30 pm. ), or purchased at the door for cash or check (no credit cards.) Online tickets can be purchased here There is a fee for phone orders and for online tickets, while purchases at the Ticket Office are free. Tickets can also be purchased (without additional fee) at the door of the venue one half hour before the show, but it is always wise to call the Ticket Office a day or two before a show to ensure they are not close to a sold out show. Join our mailing list and you’ll be informed about such situations ahead of time. A bit more about parking if you haven’t been to one of our shows for awhile: There will be the usual limited parking right behind the large Beckman Auditorium- It is OK to park in slots with names on weekends and evenings, but the lot may fill up, depending on what other events may be taking place on the Caltech campus. This is the best place to park for the handicapped (try to come a little early- email us at info@pasadenafolkmusicsociety.org if you need help planning your visit). The parking lots between Michigan and Wilson have been closed- a new building is rapidly rising at the southeast corner of Wilson and Del Mar. The most reliable parking will be on Wilson Avenue, either on the street or in the two parking structures just south of Del Mar Avenue, across the street from Beckman Institute. One structure is just north of the Institute at 341 S. Wilson Avenue, and the other, 405 S. Wilson, is just a bit south of the Institute. Rest assured that after 5PM on weekdays, and all day on weekends, you can park for free in these structures, despite signs that allude to the more restricted parking rules during the day on weekdays. You are permitted to park in slots that have names on them here as well. From the structures, walk around the big lawn (much of which is currently fenced in for the building projet to the north) in front of Beckman Institute and you will recognize where to go. On this map, we are suggesting that you park in structures #123 and #124 in the upper left. Beckman Institute is building #74, just to the east (right). If you need help figuring this out, try calling (626) 616-4559.